This removable tulle and organza skirt made me feel like a princess during our ceremony. It was so fun getting two looks on my wedding day. It was easy to unbutton and store away before the reception, allowing me to dance the night away. Worn once for approximately one hour only, this skirt is as good as new. This skirt was purchased as a medium (12) but altered to be closer to the small (10). 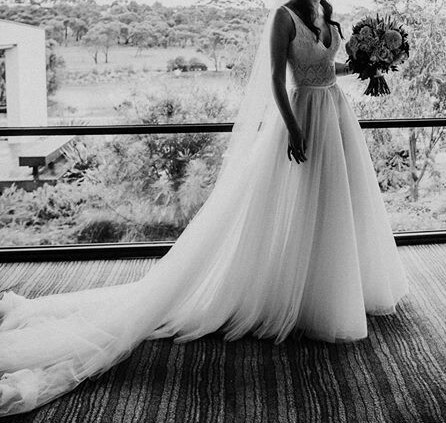 It has plenty of length (bride was 183cm tall), but any seamstress can easily shave the tulle and organza layers to height. The buttons are also easily adjusted to fit nicely to your specific waist size.